The Elder Scrolls: Legends has finally made its way to mobile devices, which means scores of new players are diving into Bethesda's popular collectible card game for the first time. The Elder Scrolls: Legends can seem a little daunting at first, but no worries: we've got all the basics players need to know right here. Read on to find answers to all the essential questions and pick up a few tips along the way. The first decision that The Elder Scrolls: Legends players have to make is picking their avatar. Each of the usual races found within Elder Scrolls lore make an appearance, and each race carries its own deck alignment. Beyond that, each race is also disallowed from playing cards of certain opposing alignments. While a player can re-select their race at any time without penalty, their chosen race is important in the late game, particularly at levels 24 and 32, where players will earn a legendary card based on their current avatar's race. Alignments work as deck attributes that favor a certain play style: Agility (green) favors cards with speed and flexibility; Endurance (purple) favors cards that increase magicka supply; Intelligence (blue) favors magic spells and creatures; Strength (red) favors damage-dealing cards, and Willpower (yellow) favors defense and large forces. • Argonians align with Agility and Endurance, and cannot use cards from the Redguard, Nord, or High Elf classes. • Bretons align with Intelligence and Endurance, and cannot use cards from the Wood Elf, Nord, or Khajiit classes. • Dark Elves align with Agility and Intelligence, and cannot use cards from the Nord, Orc, or Imperial classes. • High Elves align with Intelligence and Willpower, and cannot use cards from the Wood Elf, Orc, or Argonian classes. • Imperials align with Willpower and Endurance, and cannot use cards from the Wood Elf, Redguard, or Dark Elf classes. • Khajiits align with Agility and Willpower, and cannot use cards from the Redguard, Orc, or Breton classes. • Nords align with Strength and Willpower, and cannot use cards from the Dark Elf, Argonian, or Breton classes. • Orcs align with Strength and Endurance, and cannot use cards from the Dark Elf, Khajiit, or High Elf classes. • Redgaruds align with Strength and Intelligence, and cannot use cards from the Khajiit, Argonian, or Imperial classes. • Wood Elves align with Strength and Agility, and cannot use cards from the High Elf, Breton, or Imperial classes. 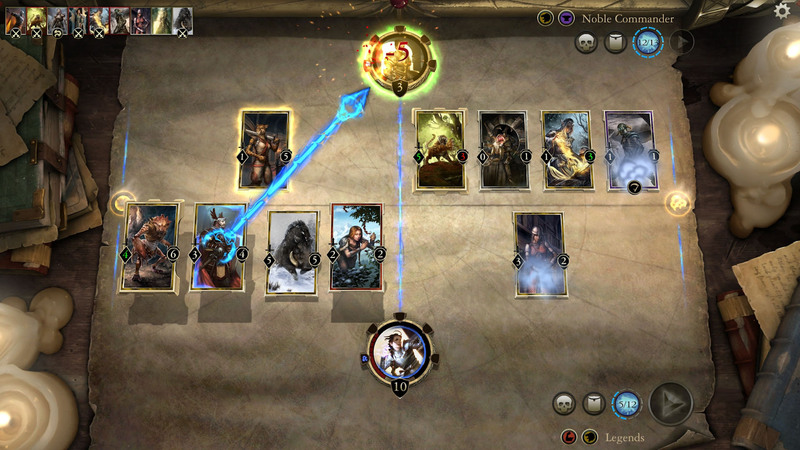 Most cards in The Elder Scrolls: Legends have three numbers: on the left side is Attack, which denotes the damage capable of being done by the card; on the right side is Defense, which denotes the amount of damage that card can withstand; lastly, the number in the upper left is the card's Magicka value, which indicates how much Magicka is needed to play the card. Attack and defense work as expected: a card with an attack value of 2 will be able to destroy a card with a defense value of 2. Worth remembering is that attacking a card that has its own attack value will cause damage to both cards: for example, if a card with an attack and defense value of 2 attacks another similar card, both cards will be destroyed in the fray. As opposed to attack and defense, Magicka works as a pool that allows or disallows the play of certain cards. Players begin each round with 1 Magicka point, and their Magicka pool will increase by 1 point each round. This generally means that opening moves will be made with lower-Magicka cards, whereas later in matches players will be able to draw multiple cards or instead draw powerful singular cards. The Elder Scrolls: Legends shakes up the usual CCG formula with the addition of lanes. Nearly all matches in the game will have at least two lanes, which means that players will have to put consideration into which side would be best for playing their cards. The important thing to remember about lanes is that creatures can only attack other creatures in that lane; though attacking from adjacent lanes is technically possible through abilities, most of the time players will be placing their cards in such a way as to oppose enemy cards directly. While players can attack enemy avatars from either lane (barring those lanes which contain a Guard card, which we'll get to later), it's generally a good idea to keep both lanes clear of enemy cards whenever possible. There's no way of knowing which cards an enemy will draw next, and a small number of potential damage to the player's avatar on the board can quickly add up to a match-losing figure if left unchecked. The last basic attribute to cards that Elder Scrolls: Legends need to be aware of are abilities. There are 12 total abilities available within the game, and each of which presents its own unique combat opportunity. • Breakthrough is an attack abilitiy that deals damage in excess of a card's defense value to the opponent. • Charge allows cards to attack on the same turn in which they're drawn. • Drain allows a card to be healed every time a creature deals damage in an amount equal to the damage dealt. • Guard is an ability that disallows players from attacking any other card in the lane. • Last Gasp cards perform an action when they are destroyed, which includes several various effects. • Lethal is an ability that allows a card to destroy any card that receives damage from it. • Pilfer cards enact certain abilities any time they deal damage to enemy cards, either by drawing an additional card or gaining 1 point to attack or defense. • Prophecy cards can be played immediately any time one of the player's runes are broken. • Regenerate is an ability that heals cards at the beginning of each round. • Shackle is an abilitiy that prevents enemy cards from attacking for one turn. • Summon cards are able to draw upon other cards from a player's deck, be it drawing additional creature cards, drawing more cards into the player's hand, or causing damage. • Ward cards are able to ignore the first incoming attack they receive. As always, players will want to consider the strategic value of their cards' abilities before playing them. Additionally, some cards are able to bestow bonuses to attack, defense, or both, and using those cards in conjunction with Guard cards or any other cards with particularly high stats can easily change the tide of battle.